It is not difficult to learn the fundamental principles of Feng Shui. I can teach you. It had been perceived as complex because most Feng Shui masters do not share and do not disclose their “trade” secrets and so mystify the knowledge of Feng Shui. One important reason for Feng Shui to be so popular especially among the wealthy tycoons in Hong Kong is because of the powerful effect of Feng shui. Proper lay out can change the energy field of the environment, and change the causal-effect of your destiny and outcome of your intent. A better way to say it is the Chinese knew all about all the buzz in the “Secret” book and about “Law of Attraction” before the West even give this a term. We had kept this a real secret for centuries, the emperor uses this to rule his empire and prevent his enemies or his subjects to fully understands this. Now this knowledge can be acquired and you can be just as effective in creating your “luck” through proper understand of these electromagnetic energy that is stronger than any Feng Shui. These energy field can be originated from another power source or another dimension. In Feng Shui we call this “ Five –Yellow”, and there are ways to neutralize this effect. This is the art and science of learning how to most effectively grid your environment in relationship to the bearing of the location- the place you live and breathe everyday. 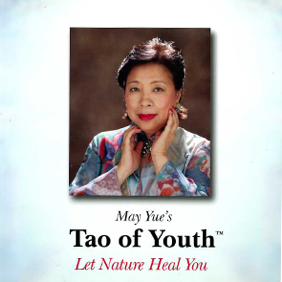 Feng Shui is not supernatural; you cannot rely on intuition alone as Feng Shui judgment. The best master is one that uses his/her left and right brain and then some “spirit dimension” of his/her third brain. What do I mean by that, I mean the master’s own vibration energy frequency is so high that he /her can tap into the spiritual dimension where he /her can help people to solve their problems with great confidence and accuracy. merits (high spiritual credits) of the Feng Shui master. The purpose of learning Feng Shui is help you understand and to gain knowledge in transforming your energy field in your environment so you can have optimal energy frequency so you can perform at you optimum so you can send you intent out well and attract abundance into your life. 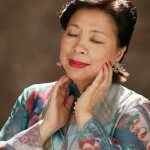 I have followed two of the most famous Feng Shui masters: their names are Master Chan Ho Yan and master Li Kui Ming. I have enclosed the nine flying star chart to figure out this year’s energy. You can down load the nine flying star chart that I have and follow some of the instruction. When I say negative stars I mean this year the Water Dragon year the way the constellation of stars, moon, sun and jupitor is positioned that we have three sectors that vibrate too strongly for us to perform our day to day activities well. We are affected by their vibrations. This year the worst star “Five Yellow” is in the South east sector of your house. The best way to deflect that is to put black quartz there or to put a six copper coins there. By putting metal copper there the energy vibrate differently and it neutralize the negative energy that five yellow energy vortex create. The “Two Black” star is at the North sector of the house. You can put white quartz or 8 copper coins there. The metal copper coins deflect the energy and changes the vibration that this star create the energy at that corner. The “Three Jade” is at the South West corner. You can put some green color stone or jade there. That also can calm that corner down. 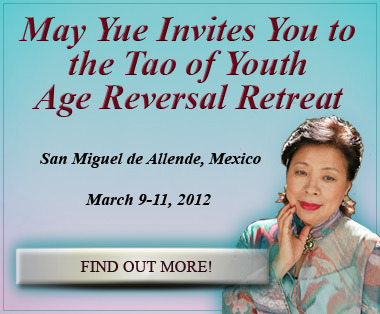 I will have a class on “Creating The Best Vibration” for the Water Dragon year at San Miguel. 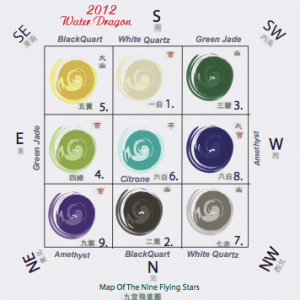 We will also talk about having your five elements in harmony for the year of the dragon 2012. Our retreat in San Miguel was a wonderful gathering of friends interested in specific natural techniques to improve their health and wellness. Here is a fun video that was taken during one of our evenings. You can see the warmth and energy in the room. Amazing! The demand for a retreat like this is very high - there was a strong following of people needing more information. Another retreat is being scheduled! Please stay in touch and don't miss it! © MMIX May K. Yue, www.TaoOfYouth.com, All rights reserved.